Come on get happy, Solo: A Star Wars Story is coming home. 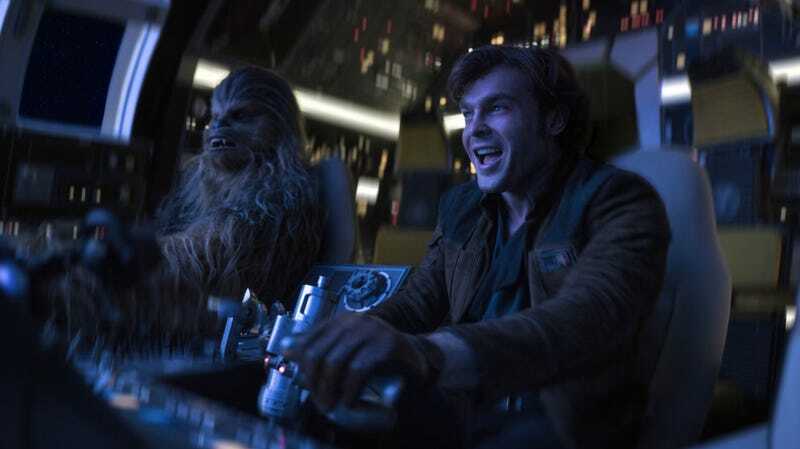 The Blu-ray release of Solo: A Star Wars Story may not have an alternate cut of Ron Howard’s film, but it does include eight deleted scenes that run about 15 minutes total, and most of them are really quite good. The scenes range from extended versions of things that already exist in the movie to wholly deleted characters, concepts, more detailed explanations, and several funny jokes. And while they’re all worth watching, here’s how we rank them, from worst to best. It’s crazy these two best buddies met in a fight. The least exciting deleted scene on this disc is, unfortunately, the longest. Running a whopping five and a half minutes, this is basically just the same Han vs. Chewie mud fight from the movie, with a bunch of additional throws, bites, and swerves. Considering how long Alden Ehrenreich and Joonas Suotamo trained for the scene, it makes sense why it was so elaborate, but ultimately, it probably dragged the pace of the film down. Han meets the leader of gangs on Corellia, Lady Proxima. In the final film, we first meet Qi’ra as Han finds her in a hallway. The deleted scene is almost exactly the same, except Han finds Qi’ra in a hidden nook that almost looks like a bed. He then explains they can get off Corellia tonight, he runs into Moloch, and then we enter Proxima’s pool. The scene is pretty dark in comparison to the final film and feels a little more constricted. But still, it’s okay. Han’s clever idea is a secret in the final film. This short scene is less than a minute but includes maybe two of the most beautiful shots captured of Han and Qi’ra looking up as Dryden Vos arrives on Savareen. That’s not the focus though. The focus is Han delivering a line that lets the audience know he’s going to double cross Dryden. By deleting it, the surprise is better, so this made sense to cut. Lots of ammunition on the ground. Walking with Beckett on Vandor, Han and Chewie get into a snowball fight. Literally. It’s another short scene—less than a minute—and it adds almost nothing, but it’s a very weird, funny tease of the friendship that has just begun to develop. The clip debuted on The Star Wars Show and you can watch it here. Lots of shady characters on the mud planet of Mimban. Much like the extended fight between Han and Chewie, this scene is just an longer version of a scene that’s in the final cut. But unlike that scene, there are some interesting additions. There’s a little more Rio, a little more Val, and the introduction of another member of Beckett’s crew who dies, but still kills a bunch of Imperials with an awesome laser Gatling gun. It’s not crucial, and it drums up sympathy for Beckett a little too early, but it’s still a good scene. This is the first of three “I get why they cut it, but it’s still awesome” scenes. Basically, this is just a minute or so of Han admiring more of Dryden Vos’ trinkets. But a) we know those trinkets are super cool, and b) Dryden offers Han some obscure delicacy, which looks like a Star Wars version of crab legs, and he hilariously and grossly slurps them up. It’s wonderful. Pointless, but wonderful. This lot is on the hunt for Han and Qi’ra. This is about two minutes of action, likely set in the time between Han and Qi’ra’s escape from Proxima’s lair and the moment they jump in the speeder. It doesn’t forward the story but it features Qi’ra out-thinking Han by forcing him to get into a gross barrel of eels. Not only does the scene feel like a nice nod to the classic trash compactor scene of A New Hope, it simultaneously feels like Han and Leia’s first kiss in The Empire Strikes Back. 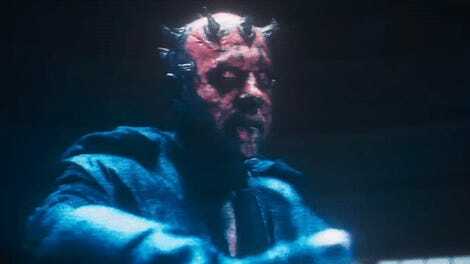 Once Han and Qi’ra are in the clear, he tries to kiss her, only to be rebuked, and then there’s a funny/creepy joke with one of the eels grabbing Han’s thigh. An excellent, albeit superfluous, scene. Yes, Han was an Imperial pilot. Of course, the deleted scene that was released online first is also the best. You can watch it here, but basically, this scene finally shows us Han Solo as an Imperial pilot who crashes a TIE and then gets kicked out of the Academy. It’s one of those things fans had always assumed happened—and though it’s teased in the movie, it was rightfully cut for timing. Luckily, though, we still get to see it here—and it’s excellent. Solo: A Star Wars Story, which has a bunch of other special features on it besides these scenes, is on digital download now and on Blu-ray today.